I remember seeing that Pongal Test at Chepauk in Jan 1977. Critics booed India for their lacklustre performance. Those were the days when Test matches had a rest day ! In that Test no. 793, England opened with Dennis Amiss and Bob Woolmer who was born in Kanpur and later died in Jamaica mysteriously during WC 2007, when he was the coach of Pakistan. Tony Greig was the captain - England were all out for 262. Bishan Bedi took 4; Madanlal and Prasanna 2 apiece. India could muster only 164 – Lever took 5/59. England were bowled out for 185 [Chandra took 5/50; Prasanna 4/55] and chasing 284, Indians were bundled out for 83 – Willis 3/18 and Underwood 4/28 inflicting the damage. Andre Agassi brought to fore what widely was a wrong perception – that men do not cry ! ~ and he is not alone for sure, when it comes reaction after losing !! After that thrashing at Vizag in the 2nd Test, British Press reacted with attempts to vilify the Indian skipper Virat Kohli of ball-tampering. Serious charges, silly attempt ! by producing inconclusive evidence to show that Kohli used the residue of a sweet in his mouth to shine the ball. They have claimed that Kohli put his hands deep in his mouth, and then shined one side of the ball, thereby breaking the law. Nobody is saying that using a bottle-top, or even a fingernail, to change the condition of a ball is right but it becomes farcical when mints become an enemy of the game. The ICC have effectively banned tic-tacs and polos. England knows it all too well – as in Australia, English Marcus Trecothick's admitted habit of sucking on a Murray Mint while he was shining the ball during the fabled 2005 Ashes. There has been no official charge and at best this be dismissed as finding solace someway hiding their loss !! 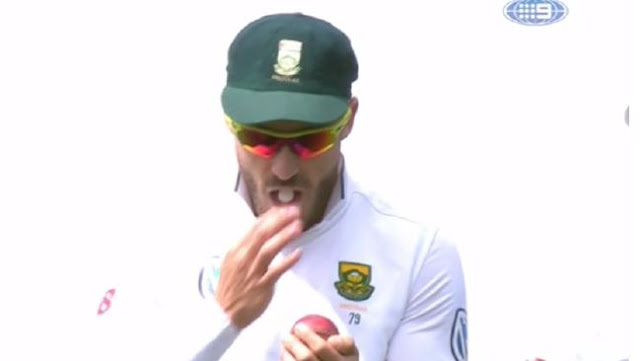 Down under, South Africa's captain Faf du Plessis has been found guilty of ball-tampering and fined his entire match fee from the Hobart Test, but will be free to play in Adelaide this week. The charge, laid by ICC chief executive David Richardson, related to clause 2.2.9 of the ICC's Code of Conduct, which deals with "changing the condition of the ball" in breach of the Laws of Cricket. The Laws of Cricket, in turn, allow that players may "polish the ball provided that no artificial substance is used and that such polishing wastes no time". This was a charge during Hobart test, Du Plessis pleaded not guilty to the charge and faced a lengthy hearing before ICC match referee Andy Pycroft in Adelaide on Tuesday. On Tuesday evening, the ICC said in a statement: "The decision was based on the evidence given from the umpires, who confirmed that had they seen the incident they would have taken action immediately, and from Mr Stephenson [MCC head of cricket John Stephenson], who confirmed the view of MCC that the television footage showed an artificial substance being transferred to the ball." In addition to the fine, three demerit points have been added to the disciplinary record of du Plessis for what was deemed a first offence. If du Plessis reaches four or more demerit points within a two-year period, they will be converted into suspension points and he would face a ban. Cricket South Africa has confirmed that du Plessis, who had been represented by CSA's legal counsel via teleconference, would appeal the verdict. An appeal would require the matter to be heard from the beginning by a judicial commissioner, who can then increase, decrease or amend the sanction in accordance with the punishments for the particular breach. The maximum penalty for a level 2 breach is a 100% match fee fine and two suspension points, which equates to being banned for one Test. In essence, du Plessis would therefore be risking a ban by attempting to clear his name. There was to be more – Guardian reports that, South Africa’s notoriously heavy-handed security guard Zunaid Wadee on Monday smashed a television reporter against a glass window for daring to ask du Plessis — who has previously been convicted of ball tampering. The ugly confrontation at Adelaide airport where Nine reporter Will Crouch was repeatedly shouldered and had his microphone knocked out of his hands and kicked along the ground, was hardly a surprise following a boil over in Johannesburg earlier this year, where Wadee and du Plessis took it in turns to engage in some argy bargy with a fan. It was reported in Afrikaans newspaper Rapport that du Plessis sent Wadee up to a corporate box at the Wanderers ground to deal with a supporter who had been hurling verbal abuse at the Proteas’ dressing room during a Test match capitulation against England. Wadee allegedly got involved in a physical scuffle with the man before ordering him down to meet an angry du Plessis face-to-face. Getting back to that infamous incident at Chepauk, during the Indian innings, the maligned vaseline incident took place. Lever, who took five for 59 in the innings (two of them on the previous day) was reported by umpire Reuben to be carrying on his person a strip of surgical gauze impregnated with vaseline. Umpire considered it to be a breach of Law 46. The M.C.C. authorities did not deny the presence of the offending strip of gauze, but offered an explanation for its use. Their version of how it came to be discovered by the umpire did, however, conflict with that of Mr Reuben. The umpire said that it came adrift while Lever was delivering the ball. M.C.C., on the other hand, claimed that Lever found it a hindrance and discarded it himself. Ken Barrington, the M.C.C. manager, said that while there had been a technical breach of the law governing fair and unfair play, the offence was totally unintentional. At a press conference the following day, the rest day, the captain and manager emphasised in further defence of Lever that the gauze strips were not worn until after lunch and that by then England had made such large inroads into the Indian innings, that such unfair methods were quite unnecessary. During that tour, Indian captain Bishan Singh Bedi, had suspicions that Lever had used polishing agent of some kind even during the Delhi test, when he routed Indians. Whatever it be, it was laid rest more because it was a breach committed by the English and perhaps Indian Board was not all that strong those days. Those of us who saw the match those days believed : Lever was unplayable; Indians fished out side the off and there was something that aided the prodigious moment of the ball when Lever bowled. Lever took 26 wickets in that series but never reproduced anything closer later. If swing bowling was an art and he could do it so well in India, why the ball never swung such in his own place in much more favourable circumstances ! 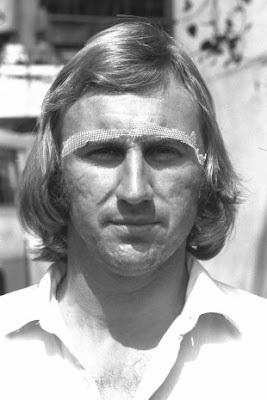 – Tony Greig had to say this of Vaseline incident : - In his wisdom, our physiotherapist decided that he should do what marathon runners do, that is put some Vaseline-impregnated gauze into the eyebrows of the bowlers. By doing so, it would channel the sweat down the side of the eye, as opposed to allowing it to go into the eyes. Well, I can tell you that it was a very silly thing to do because under the laws of the game, if you introduce a foreign substance onto the ball it is clearly cheating. Statistics reveal that out of his 73 test wickets in 21; 26 came in first 5 in that debut series !!! ~ was that poetic justice, he played his last Test against India at Leeds in 1986 when India won by massive 279 runs. PS: Vaseline is a brand of petroleum jelly based products owned by Anglo-Dutch company Unilever. The Vaseline name is considered generic in Portuguese and Spanish speaking countries, where the Unilever products are called Vasenol. In India, the product perhaps did not need any further advertising, and sold well enriching the coffers of its makers !